Week 2 – Question of the Week: Which herbal medicines do you believe in? People ask daily regarding herbal alternatives to pharmaceutical drugs. Today I’m asking our professionals: which herbal preparations do you believe in? Which are bogus? Which get the job done? Post your queries, answers, and suggestions below. Check back soon to read their comments below. This entry was posted in Education, Herbal and complementary, Herbal medicine, Medical archives, Medications, Question of the Week, See medications - herbal. Bookmark the permalink. 20 Responses to Week 2 – Question of the Week: Which herbal medicines do you believe in? Dandelion is #1 with me .. leaves have been proven to rival Lasix in its effectiveness as a diuretic (but doesn’t induce hypokalemia). Root good for gallbladder and digestive problems. Milky sap great over warts. It’s just a fabulous nutritive plant, as is burdock. Quality probiotics for c.difficile (personal experience here), traveler’s diarrhea, diarrhea associated with the flu, etc. and the Lord bless motherwort! Excellent for perimenopause/PMS complaints of every sort. passionflower, wild lettuce, california poppy, chamomile, skullcap for sleep – more so than valerian. Valerian is nice for some people, for others, it simply makes their legs feel rubbery and excites them instead. I could go on and on, but these are probably the ones I use and/or make up the most. I favor tinctures since they have an almost endless shelf-life (except for some things like shepherds purse and lemon balm, etc), they are the most portable, easy to titrate dosages to fit any age group, and I don’t have to worry about it losing its effectiveness over time (like capsules or pills). I find HerbPharm to be one of the most reputable and quality conscious firms – I have no commercial interest since I make nearly all my own tinctures. I have not seen any reference to the medical benefits of honey. Check out Honey, The Gourmet Medicine, by Joe Traynor.To quote the opening lines, “The medicinal properties of honey have been known since ancient times. A Sumerian tablet, possible dated 3000 BC, prescribes honey to treat an infected skin ulcer.” The list of illnesses and injuries that can be treated with honey is quite extensive. 1. Cut Vitamin E gel capsules an use the liquid to put on fresh burns to help prevent redness, pain, and scarring. It does a good job. 2. MSM helps a lot for joint pain. Take in conjunction with glucosamine condroitin and vitamin C. First discovered its benefit on a Great Dane we adopted who had had undiagnosed lyme disease. The vet said she would have to have got it before we adopted her considering the time it would take for our Great Dane to suddenly not be able to stand. We gave it to her on the vets recommendation and in 3 days she was able to stand and though she was plagued with arthritis from then on, she was at least able to stand and walk. Helps us older folks with our aches and pains. We notice the difference if we miss our MSM. Several others we have recommended this to have tried it and it has worked wonders for them to. Can’t be a placebo effect for the Great Dane as the effect is clear and she would have no idea what we were giving her. 3) Vitamin D3 up to 15,000 in winter with as much vitamin C you can take without getting diarrhea to build up immunity. Recommended to us by our Dr to take year around but even more so during the flu season. Has worked well so far despite plenty of exposure. After taking the D3 for almost a year, after drawing our levels the Dr said they are better than any of her patients but still not up to the recommended level so it would take a lot to get too much. 4) Diphenhydramine hydrochloride (generic benadryl) helps a lot with our allergies. Note–some people will be made drowsy with this. The generic is cheap and can be bought over the counter. How many doctors have the knowledge, experience, and intuition to work with a variable product? However, those questionable products are still valuable for those who have no other options. Doctors who are totally dependent on chemicals are very limited in emergencies such as we are trying to be mentally prepared for on this type of board. Their value is just about equal to a cook with no food. Useless. Although many doctors have little experience with herbal products, we do have experience with bodily manifestations of disease and chemical (pharmaceutical) reactions. When using a new or variable product, close observation of the patient is mandatory – maybe every five minutes, or five hours, or five days. Not all docs are comfortable with this. The art of medicine is more difficult to learn than simple facts. Some of us would welcome the challenge, though. Perhaps the main difference is, having been taught in the scientific method, we can separate the bogus from the real a little better. Even with medicine it’s often difficult to say whether a drug or nature caused a patient’s improvement. It takes an open mind and sufficient time to learn. I won’t repost the whole thing, but I put up my list of well accepted “herbals” in the “Rethinking Herbal Meds” thread. Basically, my thoughts are that belief should have no part in this. Either there is data or there is not. However, there is also the fact that no storage supple will be infinite and if the balloon goes up, we will be using herbals or nothing in pretty short order. Basically I prefer proven treatments. Most alternative medicine is bogus. Some treatments have benefit, but due to lack of market in the US the cost for FDA approval is too steep. Wormwood extracts for malaria are a good example. It is state-of-the-art malaria treatment worldwide. Also dukoral for traveler’s diarrhea, available in Canadian pharmacies. There are lots of good studies on both. I have two philosophies on this. One is that natural is a misnomer unless it came from a gland in your body. Insulin, steroids, thyroid hormones….. Natural. Aspirin, willow bark, tobacco, metal plate… Not natural but may be beneficial when needed. Of course you could market the plate as a all natural mineral supplement to restore the natural alignment and symmetry of your bones. But it is still a plate with screws. Second I go with science-not-speculation medicine, regardless of what category it falls in. Many providers and patients are brand name (natural vs artificial) loyal to the point of religious fanaticism. It’s good to understand that while Rx meds usually work better, a few alternative treatments may be appropriate for those rare individuals who don’t tolerate the better Rx med Also from a prepper standpoint, it is good to be aware of some of these treatments. Third I see the world as a competition between animals/bacteria, fungus, and plants. Each one provides exudates to fight each other for space and resources. The rest of the discussion really is about concentration, purity, efficacy, availability and side-effects. yellowroot tincture – similar in antibacterial and antiviral properties as goldenseal but different genus-species. Dried root in vodka, long shelf life. Used for respiratory illnesses – bad colds, bronchitis, etc. Be aware of hypoglycemic side effect. chickweed salve – can be bought commercially from Lehman’s Non-Electric Hardware online or made at home: chickweed, comfrey, peppermint essential oil or crushed dried leaves, lavendar, rosemary and eucalyptus mixed in base of olive oil and beeswax. Best salve for poison ivy, poison oak, and poison sumac. aloe vera – burns. Break off end of “leaf” and rub gel on burn, often won’t even blister, gets rid of pain, healing. Live plant does well indoors over winter and outdoors during summer even if you don’t have green thumb. Good source for herbal supplements: vitacost.com – name-brand herbal supplements at lower cost, fast one-rate shipping, fast delivery, reliable company – I have no personal connection with them! Mepilex borders – best dressings for wounds and skin tears; can help prevent Stage 2 pressure ulcers from progressing into Stage 3; can be left on for 5 days and removed from fragile skin without ripping skin or removing healing granulous tissue underneath the dressing. Available from medical supply stores in 4″ or 6″ sizes. Helps prevent infection on open wounds. For the Dentist its got to be Oil of Cloves (Eugenol). It is a marvelous obtundant for pulpal pain. I refer you to that scholarly work on the subject, Marathon Man: 1976 movie where Sir Laurence Olivier offers Dustin Hoffman a bottle as reward for cooperation. Also it can be mixed with Zinc Oxide to form a paste that will harden. This is the basis of many OTC dental temporary fillings. Clinical uses: treatment in Alzheimer’s, amyotrophic lateral sclerosis, diabetes, hepatitis C, multiple sclerosis, rheumatoid arthritis, and Tourette’s syndrome. Cannabinoids have been shown to produce an anti-inflammatory effect by inhibiting the production and action of tumor necrosis factor (TNF) and other acute phase cytokines, which also makes them ideal compounds to treat the autoimmune forms of arthritis. It is now suggested by some researchers that these widely spread cannabinoid receptor systems are the mechanisms by which the body maintains homeostasis (the regulation of cell function), allowing the body’s tissues to communicate with one another in this intricate cellular dance we call “life.” With this knowledge of the widespread action of cannabinoids within all these bodily systems, it becomes much easier to conceptualize how the various forms of cannabinoids might have a potentially therapeutic effect on diseases ranging from osteoarthritis to amyotrophic lateral sclerosis (ALS). Another one of the exciting therapeutic areas that cannabis may impact is chronic pain. Cannabinoids produce analgesia by modulating rostral ventromedial medulla neuronal activity in a manner similar to, but pharmacologically distinct from, that of morphine. This analgesic effect is also exerted by some endogenous cannabinoids (anandamide) and synthetic cannabinoids (methanandamide). Ideally, cannabinoids could be used alone or in conjunction with opioids to treat people with chronic pain, improve their quality of life and allow them to return to being a productive citizen. NOTE: The DEA has regulated cannabis and in many states it’s medical use is unlawful. There are currently 15 states that have passed Medical Marijuana Laws since 1996. Check the www. NORML.org site map for individual State laws concerning Medical Marijuana Programs. The site will only allow you to copy this one page, on Saw Palmetto, once without registration. Clinical uses: as shown by Clinical Studies below. Enhancement of Glycemic Control in Poorly Controlled Patients with Type 2 Diabetes Mellitus. Improvement of glucose metabolism in treated, uncontrolled overweight to obese patients with type 2 diabetes. Treatment of Atypical Depression: effect on carbohydrate craving. Gregory M. Singer, Jeff Geohas. Diabetes Technology & Therapeutics. December 2006, 8(6): 636-643. doi:10.1089/dia.2006.8.636. Used in the treatment of stomatitis, due to oral or gastrointestinal Candidiasis, or secondary to chemotherapy, radiation therapy to oral, pharynx, tracheal, or intestinal mucosa. Used as a pro-biotic for the treatment of replacing or increasing colony count of beneficial flora in the mouth and GI tract. Can also be used to repopulate beneficial colonies to counteract effects of vaginal mucosa being populated by yeast. ie: killed off by antibiotics. Aids in digestion, lactic acid production, lactose intolerance, and constipation. Note: Best stored in refrigerated environ as it is Temp. unstable d/t being a live organism. Persons with suspected intestinal disease or damage, immunodeficiency, or with overgrowth of intestinal bacteria should NOT use acidophilus. When any real scientific tests are conducted on these herbs the result is usually that they are ineffective. St. Johns Wort was tested a few years back and found to have no value in treating depression. In general where herbal remedies have been found to be of any value they have been incorporated into science based medicine. One of the problems with prescribing herbs to treat real diseases is; what is the dose? Two leaves? One root? Smoke until you pass out? Plants vary greatly in their chemical contents when grown on different patches of land and at various times of the year. How much of the”magic” chemical are you getting? No one knows. Not the witch doctor and not the patient/victim. What we are talking about is a superstition based pseduo-medical practice that at best does a disservice to the victim/patient because it denies them real medicine but at worst causes death. In my opinion it does not reflect well on anyone in the medical field to advocate for herbs and supplements and my advice is if your doctor or nurse does suggest an herb or supplement that you run from them and find a real health professional. Then why are you on a board like this? And what do you advocate if people don’t have their own lab and chemist to concoct them an acceptable potion in your book? The Bible says God gave us our food for our medicine. therefore, herbs and minerals are acceptable for medicine. The idea that we should avoid them because we don’t know for sure how strong they are does provide a question. How many doctors have the knowledge, experience, and intuition to work with a variable product? However, those questionable products are still valuable for those who have no other options. Doctors who are totally dependent on chemicals are very limited in emergencies such as we are trying to be mentally prepared for on this type of board. Their value is just about equal to a cook with no food. Useless. if you desire to prepare yourself to be useful in a case where you cannot reach your chemicals you might learn what herbs have traditionally been used for, and even experiment somewhat with them so you expand your knowledge into the field of the natural. 1. Vitamin D3. Prevents colds and flu. Even though I’m an RN, I’ve not had a flu shot in years, and haven’t had so much as a cold in 20 years +. (I’m 50). Take the kind that look like little oil-filled pears. Get your level measured and keep it between 40 and 60ng/ml. Of course you can always get it naturally by getting out in the sun with no sunscreen for 10 minutes a day. 2. Gymnema Sylvestra can lower blood sugar. 3. Benfotiamine (a fat soluble B vitamin) can lower blood sugar. 4. The best natural treatment is prevention. Stay away from processed foods, especially sugar and flour. Wheat is particularly harmful. Eat lots of vegtables and grass-fed beef. Treat fruit like a dessert. Make sure you get enough fat, even saturated fat. 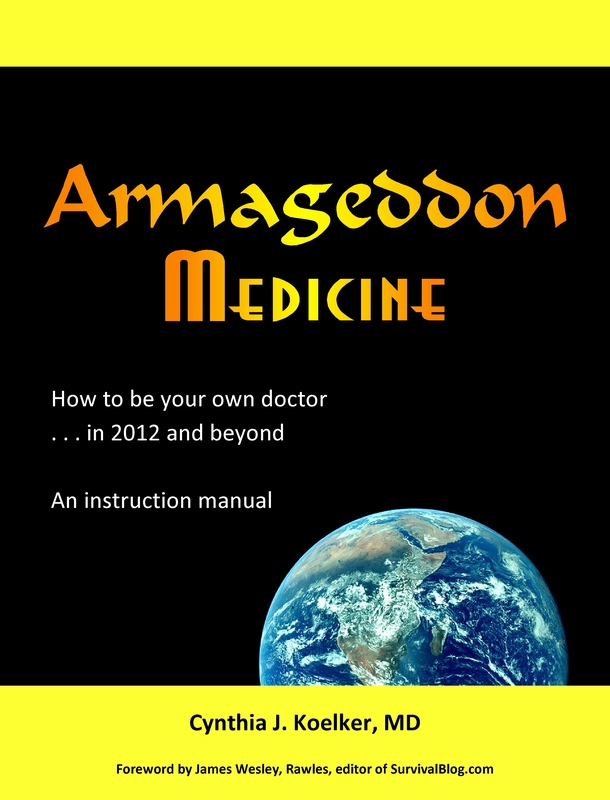 It’s not the demon conventional medical wisdom makes it out to be. Avoid industrial seeds oils like Canola and corn oil. Use beef tallow and real butter instead. I forgot silver as an antibiotic. Well proven to kill lots of types of bugs. I keep a tube of 23ppm silver gel. This possible saved my life, or at lest my arm. I hit my elbow and it somehow got severly infected with cellulitis. My wife went to the health food store and the guy there told a story about how a friend of his was in the hospital with MRSA (skin) and was not responding. He got him some silver and within 3 days the infection was gone. The same thing happened to me. Within 12 hours of applying it I was drastically better. In 3 days the infection was gone. I was also getting Rocephin, but I had gotten that for 5 days (IM) with no effect at all, in fact it was getting much worse. Maybe the Rocephin suddenly became effective, who knows. But after that, I always keep a tube of silver. DR RN, Do you have a brand name you like best for the 23ppm silver gel? St. John’s Wort is effective for MILD depression. Melatonin (not really herbal) helps with phase delay sleep disorders. Valerian helps with OCCASIONAL MILD insomnia. Saw Palmetto helps with BPH.